If possible, pull your boat from the water. Tie your boat to a tree on shore or a large log. If you’re camping on a sandbar, run your line (rope) through the handles of all of your gear. If water rises suddenly during the night, your only concern will be taking down your tent and getting into your boat – not tracking down your gear as it floats away. 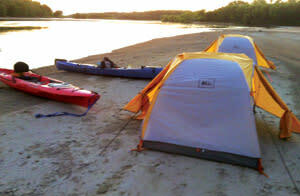 If you’re camping on a sandbar, set up well above the water line. Use long, metal tent stakes to pitch your tent. Shorter stakes may not hold in the sandy surface, and plastic stakes may break if you encounter rock. Store your food properly to keep away raccoons and other unwanted visitors. Take your waste with you and leave the campsite better than you found it. Visit our Lodging page for more information on campsites, cabins and other accommodations.